Announcement My inspiration comes from the beauty of nature and the fluidity of most classical music. Every time I go on nature walks in the Rocky Mountains I am in awe of the vast beauty and complexity of all around me. The twisting of trees, the winding of nature trails, the movement of the rivers and streams, the delicacy of flowers, and the graceful flight of birds and insects are just a few of the things that inspire me in my creations. I am in awe of all the amazing things God has created for our enjoyment! Add to that the great symphony's of world renowned composers and you have a picture of where my ideas come from. 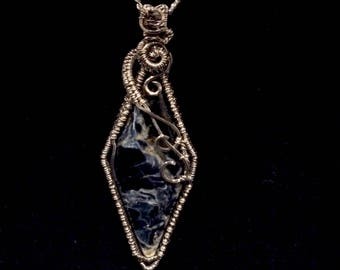 When listening to classical music I envision fluid lines twisting and turning as the wire in my jewelry twists around the pieces of natural stone used in my work. These stones are a constant reminder of the amazing world around us. It is a joy to be able to have a piece of our planet with me at all times. I am also inspired by many other wire artists. I will never sell a piece identical to any other artist though. I take bits and pieces of things that stand out to me and turn the idea into my own creation. Any item created using a tutorial will give the original authors name, even when changes are made to the original design. I do not believe stones can enhance any spiritual scenes or promote well being, I do believe that copper and amber have anti-inflammatory effects, as I have personally felt the effects of coppers with arthritis. I see these stones as a gift from God to show us how much he loves and values His creations. To create something so seemingly unimportant, as a beautiful stone, for our enjoyment is proof enough for me. Many may disagree and that's okay with me, I am not offended by the opinions of others and hope you are not offended by mine. I truly hope you enjoy these pieces as much as I do. My inspiration comes from the beauty of nature and the fluidity of most classical music. Every time I go on nature walks in the Rocky Mountains I am in awe of the vast beauty and complexity of all around me. The twisting of trees, the winding of nature trails, the movement of the rivers and streams, the delicacy of flowers, and the graceful flight of birds and insects are just a few of the things that inspire me in my creations. I am in awe of all the amazing things God has created for our enjoyment! Othoceras Fossil Wire Wrapped in Recycled Copper-on sale! What a beautiful necklace! The Labradorite is so cool; the flash is brilliant, the sterling silver wrap is gorgeous and the ribbon chain is very pretty and different. Love it!! It is a lot larger than I expected. Still a beautiful stone in a beautiful setting. It might help if Brooke would show her items next to something of standard size, maybe a U.S. quarter, or a dollar bill for larger items, so we can judge the relative size of a setting. How it all started, again. I've been making chainmaille for a while and selling it at cost to a store in Estas Park, Co (up in the Rocky Mountains). I did that so I could keep "playing". Friends and family told me I should do more, but cost kept me from doing anything else with wire. I made a few custom pieces for friends, from stones they collected, but nothing more. There was a listing on Craig's List for an open market close to my home. It made me think I could do more and the booth price was low! I sold enough at that event to make my money back and then some! I never thought anyone would pay for my time. I put so much time and energy into my work and scrap things I think are messy, flimsy, or just don't look right. After having a successful market day, on what they called slow, I booked again for the following month, opened an Etsy store and made a business Facebook page. You can find it by "looking for friends" under the name wrapped wired twisted. Now I work on new pieces at least once a week to keep up my inventory and will be participating in more outdoor and indoor markets around where I live. So, now here I am a year later enjoying the Etsy community! I hope you enjoy what see as much as I have enjoyed working on these! I do not sell outside of Etsy and local markets. All custom work will be done through Etsy, even if we met at a market. Thank you for stopping in! I'm so happy you are here, feel free to browse around. If you see something you like, but would like it in a different color or material let me know, we might be able to work it out together. I am happy to take custom orders. Please visit me on Facebook where I try to add extra info on events and add some works in progress, as time goes on I will post more of these to give you an idea of the creation process. My Facebook page is Wrapped Wired Twisted, just search for new friends and like the page to get updates as they are posted! Most items are posted to my FB page prior to Etsy in order to give close friends and family an opportunity to purchase before it goes on sale for everyone in my Etsy store. If you would like to purchase an item that is only posted on FB please message me and I will send you a link with a "RESERVED FOR.." listing in my Etsy shop. I do not sale items to anyone other than close local friends and family through Facebook or any other web site. I do however attend markets in the area and will sale items in person at those events ONLY. All purchases, other than market sales, MUST be made through Etsy. Shipping locally is not expensive and using Etsy as a buffer is for your safety as well as mine. My Facebook page is made to give people who follow me a first priority to buy items before they are available to everyone else, and also to give my customers a more in depth look into my art. All jewelry is covered by a 3 month limited warranty. Broken items will be repaired at my expense. Return shipping will also be paid by me once return is approved. This warranty will ONLY cover any breakage, or loose wires due to workmanship. I try very hard to ensure all items are solid and strong enough to handle everyday wear. Unfortunately sometimes I may miss something that will effect the quality of the piece. If this happens I want you to be covered. My goal is to send you something you will enjoy wearing for years to come, and something that will last too! Damage from inappropriate use is NOT covered. This includes improper cleaning, excessive tugging, pulling, twisting, etc. I reserve the right to judge for myself what is and isn't damage from inappropriate use. If you re unhappy with an item you receive please contact me within 7 days of the items arrival. You may exchange the item for any other item, of the same value, from my Etsy store*. I may also be able to make a custom piece that fits your needs better. Return shipping is the responsibility of the customer. The replacement item will ship for free. Only one exchange per transaction. *This excludes custom orders or added cabochon grooving as these are specialty items. Customers who place a custom order will be sent pictures of the item before it ships and during the creation process to ensure that what is being made is what the customer wants. Changes to anything need to be requested while the piece is in progress. Changes in the order may also change the price depending upon the requested changes and how far along the piece is, major changes cannot be made that require the piece to be deconstructed. A photograph will be sent before the item is shipped to ensure it is what the customer expects. A message must be sent for approval of the item before it is shipped. This ensures the customer knows what to expect prior to shipment. Items lost or damaged in transit need to be referred to the postal service, as all items are insured to insure you are covered. Please let me know if you are facing an issue with the post office and I will do my best to help resolve the issue and start on a similar piece to replace what was lost is damaged. This new item will have to be paid for out of the postal insurance return. Now accepting Etsy gift cards, credit cards and PayPal! If you would like to put an item on layaway please message me to set up a payment arrangement. A 25%, nonrefundable, holding fee is required. All items must be paid off within 2 months, if something comes up and extra time is needed please contact me immediately to make further arrangements. Your item will ship as soon as the last payment has been made. If you choose to discontinue paying on an item in layaway the payments you sent previously will be reimbursed minus the 25% holding fee. If you would like something in gold I will have to order it. In this case an extra payment may be required to cover the cost of the amount of gold wire used in the project. You will not be required to pay for any extra I order or do not use on your piece or my shipping cost, I will cover those. Since gold prices fluctuate a price will be given at the time the order is placed. Any taxes, customs fees, etcetera are the responsibility of the customer. See shipping policy for more information on international shipping charges. Customs fees for items needing repair will be the responsibility of the customer, I will only pay for standard shipping to and from. All standard items will be shipped out between 1 and 4 business days, excluding custom orders or otherwise stated in the item description. Please note if you are ordering from any other country other than the USA...All extra fees will be the sole responsibility of the purchaser. I do not pay any customs fees, so please check your countries customs policies. I will not lie on customs forms. What is being shipped is what will be on the form. If you purchase multiple items the second item will ship at a discounted rate, you will only pay for the additional postage cost, if any. I will reimburse any extra charges, exceeding $2.00, that has been charged as soon as the items ship. Please note there is a $0.50-$1.00, depending on size of package, charge added to the shipping cost to cover packaging. If you have multiple items shipping in the same package the added fee will also be refunded. I don't know how to offer discounted shipping on multiple items, so please bear with me as I figure this all out. If you are not reimbursed within 3-4 business days please message me and I will resolve this right away. If you place a second order within a day or two of your first please send me a message and I will do my best to send the items together to save you on postage. Custom order shipping times will vary depending on the complexity and materials of the requested item/s. If I do not have the supplies on hand I will have to order them, this will take a little longer. I will do my best to get your item out to as soon as possible. You will be contacted during the creation process to give you an idea of how far along your piece is in the creation process. Please feel free to contact me at any time for updates. I will do my best to keep you posted and answer any questions. Wire I keep in stock: Sterling Silver, both solid and filled, copper and brass. Another option is nickel silver, it is a low cost option that looks exactly like silver and endures just as long, but is 1/2 the cost. It is also tarnish resistant and requires very little cleaning and maintenance that comes with sterling silver. Please note that some people are allergic to nickel, so make sure that you or the person you are buying for is not allergic to nickel. Silver filled wire is a thick coating over brass or copper. The coating is very thick and will not wear away like silver plated wire will. I can also make items with gold wire if that's your preference. Gold wire is not something I keep on hand and will have to be ordered. The average wait time for gold wire is 3-10 days. This generally comes within 5 days. All custom order require a down payment of 25%, with the exception of gold items, an additional may be require. I will contact you in advance of any extra fees. You will NOT pay MY shipping fee for items I order, only the cost of the supplies. The remainder will be required before the item ships. If any item arrives broken or not as portrayed in the pictures and description please contact me right away. I do my best to package and photograph items carefully, but accidents happen. If it is dammage occurs due to poor packaging your item will be replaced free of charge. If it is due to negligence on the part of the shipping company I ask that a complaint is filed with them, as all items will be insured. I will do my best to make sure you are reimbursed or the item is replaced as soon as possible. If I have to remake something due to shipping damage that item will be moved to priority and I will do my best to reship in 1-2 working days (Mon-Sat). If the item arrives and it is not as described, please contact me right away to remedy the situation before filing a complaint. I photographe all items in natural light when possible to give you the best image of items, but due to differences in monitors items may appear a little different.